Christ heavenly ministry is of the order of Melchisedec. His earthly ministers are to be of the same order. 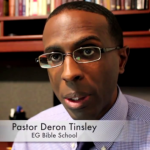 Listen as pastor Deron Tinsley explains this most important topic.